ENTERTAINMENT BOOKS 2 FOR $28! TODAY ONLY! Get 2 Entertainment Books for $28 plus $1 shipping! Only $14 per book! Best deal for the book this year! RESTAURANT.COM 60% OFF CODE – TODAY ONLY! Get $25 Restaurant.com gift certificates for $4! Regularly $10, it’s on sale for 60% off! Use code: HURRY. Deal is Today Only – Tuesday, February 26, 2013! No expiration date on the certificate. A couple hundred restaurants with this deal in the northeast Ohio area. Restaurants like Daddona’s, Kallie’s Family Restaurant, Pickwick, Mia Bella, the Mad Greek, Dave’s Cosmic Subs, Maxi’s, Lemon Grass, Grumpy’s Cafe, Taste, Melting Pot, Otani’s, White Oaks, Shula’s and many more! Restaurants are all across the U.S. – great to get when travelling! Get these coupons and more on Coupon Network, part of the Catalina network. Find out the deals to trigger Catalina’s to print at the register. At Saving Star there is no need to print a coupon. Just click on the ones you want and it ties them electronically into your loyalty cards that you set up. Easy as a one letter crossword puzzle! Get deals on jewelry, watches, electronics, and tons of other items. Bonus 45% off this weekend on already discounted items! A COUPON GUY EXCLUSIVE DEAL! NOW ON SALE FOR $14! Half price (reg $28)! Add $3 shipping and handling (I can sell them for $14 at my classes or if you see me ask me for one!). A bargain for so many coupons! Buy 2 at this price! Or use code BATTERYAR13 online. Buy 1, Get 1 FREE CVS/pharmacy Brand Pain Relief on CVS.com. Get 50 4×6 prints for just $6 at CVSphoto.com. Use code PICTURE6 at checkout, minimum 50 prints required. Offer valid online only. Offer ends 3.2.13. Receive $10 Dave’s gift card with $100 retailer gift card purchase. Look for a $5 off $25 coupon that is good on Saturdays. Use the coupon at Giant Eagle. YMMV (your mileage may vary) as not all Giant Eagle’s have been consistent as to what they will take and what they don’t. If the coupon makes you purchase groceries at Dollar General instead of Giant Eagle then I think they should take it! Check their fish food, bird, and other pet section for half off deals. Up to 80% off on their clothes and home items. Officemax is getting bought out by Office Depot. Approval is still pending, but its pretty much a done deal. There is only one Office Depot in Ohio and that’s in Marion. They used to have some in the Cleveland market, but they closed. Some states have both stores, so I would think there would be some consolidation there. Starting 2/23, shop at Old Navy and take $15 Off $75 or $30 Off $100! Use code SAVEMORE. Ends 2/26. Restrictions apply. Save $10 on Satin Strands 18″ and 22″ premium human hair extensions with promo code 444219! Buy One Get One Free Salon and Spa Equipment! Use Promo code 555277 Sale Ends 2/28! BOGO Age Beautiful permanent and demi permanent hair color with promo code 444119! Free One ‘n Only Argan Oil full size hair care or color with purchase of Argan Heat full size styling tool w. code 444252! Free FingerPaints nail color with purchase of top coat with promo code 444370! Offer Valid through 2.28. Free Heel to Toe Red Foot file with purchase of Heel to Toe full size treatment with promo code 444288! Valid Through 2.28. Save $8 on Marcal Small Steps Paper Towels 15 rolls/case, now only $10.99 at Staples.com! Take $25 off the purchase of a case of Hammermill 8.5″x11″ CopyPlus copy paper! 10 ream case, limit one case per customer. Staples® 8.5″ x 11″ copy paper, 5-ream case – Pay $24.99 – $20 back in Rewards = $4.99 after Staples Rewards – Valid February 24 – March 2 – In store only. Limit 2 per customer. Fill your bag and SAVE! Get your bag, Get 20% off – Valid February 24 – March 2 – Retail Coupon Code: 93154, 37467 Offer valid 2/24/13–3/2/13. Valid in store only. Free bag while supplies last. 20% discount will be honored if bags are out of stock. Exclusions apply. Limit 1 per customer per day. Look for a $25 transferred prescription coupon in ad. Now thru February 24th get the Entertainment book for $19.99 PLUS Free shipping! Look for more deals this week. Click here for some Reynolds Wrap coupons including .75 coupons that double at stores that double .99 and less. Take an Additional 45% Off Woodcraft Magazine. Enter coupon WOODSPEC During Checkout – Just $6.57 for 1 Year With Coupon! Take an Additional 20% Off Family Fun Magazine. Enter coupon WKLYSPEC During Checkout. Take An Additional 15% Off at Best Deal Magazines. Enter Coupon Code PXCJ0303 During Checkout. Offer expires March 3, 2013. Take an Extra $5 off $30 at Best Deal Magazines. Enter Coupon Code MNDCJ0303 During Checkout. Offer expires March 3, 2013. Take an Extra $7.50 off $40 at Best Deal Magazines. Enter Coupon Code MQQCJ0303 During Checkout. Offer expires March 3, 2013. Take an Extra $10 off $50 at Best Deal Magazines. Enter Coupon Code MQPCJ0303 During Checkout. Offer expires March 3, 2013. Take an Extra $15 off $70 at Best Deal Magazines. Enter Coupon Code MTKCJ0303 During Checkout. Offer expires March 3, 2013. Get Free Shipping on Any Order (No Minimum)! Get these deals and tons more. It’s like a flea market on your PC. Get these deals and more on Deal Chicken. 50% off pierogies from Pierogies of Cleveland – get $30 worth for $15! DID SOMEONE BOGART MY COUPONS? Nobody likes it when someone bogarts your coupons. This past week there were no Smart Source or Red Plum coupons. It was planned. The coupons don’t come every week of the year. They typically don’t have them during holiday weeks. This time it was because of Presidents Day. Yes, even the low-end holidays are special enough for the companies that make coupons to shut the coupon-birthing machines off for some rest and relaxation. I don’t see why because it’s not like people decide that holiday weeks are a good week to just not shop. Conversely, it is a week when most people make some fancy dinners or cookouts and have huge shopping lists. Now there are times someone decides that your coupons in your mailbox are just too tempting to pass up and so they bogart them. I’ve even seen people bogart them from newspapers at the store. They filter through some of the papers and put the coupon inserts from papers they are not buying into the paper they are buying. That’s not nice and illegal. I always buy extra papers and there are times when one or two are missing inserts. I usually check, but not always. So any criminal that is reading this, please do not bogart coupons. Get $75 when you open an account by 2/24/13 with at least $100 then set up automatic deposit of at least $100 into your checking account OR make 10 debit card purchases in 60 days. Visit a Huntington branch or go to http://www.huntington.com/75 dollars. Get $125 when you open a Chase Total Checking account and set up direct deposit. Admission prices to the Cleveland Aquarium dropped $2 to $19.95 for adults, $15.95 for children ages 2 to 12 and $17.95 for seniors 60 and older and those in the military. It’s located in the Powerhouse on the west bank of the Flats. A new Deep Sea exhibit is now open. I remember when the aquarium was at Gordon Park. I went there a few times when I was a young whippersnapper. The park is now mostly softball fields now. I played some softball there. It’s right near the Power Plant by East 55th. Water from Lake Erie is used by the plant and when it is put back in the lake the water is much warmer. So much so the fish come from all parts of Lake Erie to hang around it. They toss aside all their winter coats and put on bathing suits it’s so warm. The fish get careless though. Seagulls swarm the area and dive bomb the water while the fish are congregating in the warm water. So many seagulls coat the sky a shadow forms over the sky. Some fly too low and get nailed by trucks. So sad. Chad, a fish not native to Lake Erie, come to shore to get warm and with the temperature changes they die en masse. Sometimes on a day when the waves are real high, the fish will end up on the freeway. They are small fish and stink like a fermented dirty sock. If I keep my passenger car window open they sometimes end up on the seat next to me. We usually strike up a conversation about stuff like baseball and weather before they croak. Not far from there is Dike 14. It’s a manmade area. Muck dredged from the Cuyahoga river was used to make the area. Migrating birds are found at the Dike. The birds use it like a trucker does a freeway truck stop. They catch a smoke break, meet up with old pals, finish some Sudoku puzzles, and talk about stuff they ate along the way, and they freshen up with a nap or two before they go onto their next stop. I think one time I even saw a bird downing a Pabst. Either that or it was a very ugly man that was wearing tattered clothes. As much as I squinted I couldn’t tell for sure. Mermaid Memo- Full of health tips, delicious recipes and an informative featured article, the Mermaid Memo provides exclusive details on all things Chicken of the Sea every month. Club Rewards – Every month, Mermaid Club members have the opportunity to win prizes like sample products, coupons and Chicken of the Sea memorabilia. Birthday Club – A special membership perk for Mermaid Club Members! As a member, you’ll receive a money-saving coupon on your special day. What not a better way to go grocery shopping for seafood than to go fishing. The cost to get a fishing license is only $19. For some folks it’s even less or free! So find yourself a puddle and start fishing for dinner. Licenses went on sale for this year on Feb 22, 2013. The new license will be valid through February 28, 2014. Resident Fishing License $19.00 for persons age 16 through 65 who have resided in Ohio for the past 6 months. Resident Senior Fishing License $10.00 for persons age 66 and older born on or after January 1, 1938 who have resided in Ohio for the past 6 months. One-Day Fishing License $11.00 for residents and nonresidents, one (1) One-Day Fishing License may be exchanged for credit towards the purchase of an annual fishing license (minus writing fee). For residents and nonresidents – can be purchased in advance of scheduled charter trip. To validate the license, anglers must sign it and fill in the date at the beginning of the trip. If the trip is cancelled, anglers keep the un-validated license until they are able to re-schedule the trip. All above costs include a $1.00 writing fee. Ohio residents born on or before December 31, 1937 can obtain a free license at any license outlet or online. Persons who are mobility impaired and require the assistance of another person to cast and retrieve. Residents of state and county institutions. Holders of “Veteran” license plates displaying the international wheelchair symbol. Certain veterans who are permanently disabled. Half off sushi and other food in the bar for dine-in only – M-Th – 5 to 8 PM. Drink specials also. Monday through Saturday from 5-7. During happy hour, all food and beverages are 15% off. Wed – Fri – Half Price sushi from 4:00 to 6:30. Lure Bistro Happy Hour Menu (Bar Only Mon – Sat) 4 – 7 pm. $5 Happy Hour every Tuesday through Friday from 5pm to 6:30pm at SASA’s bar. All Evening Every Monday! Order from our $5 Happy Hour Menu and enjoy the items for just $5 each! Mondays – Enjoy our $5 Happy Hour Menu, and choose from small plates, half pitchers of draft beer, select martinis, wines, and sake, all for just $5 each. Every Tuesday, 5 featured sakes are offered at a special price. Create A Roll($10) – You select your favorites and our talented chefs will create your own custom Sushi Roll! Menu Subject to Change. Dine in only. Half off sushi on Tuesdays. Half price wine & sake night. Select Bottles of wine and sake are available at half price! Monday – Friday (except on Tsunami Nights) Enjoy $4 Martinis, $4 Maki Rolls and other specials! Happy Hour is served at the bar and in the lounge area. Half off sushi on Wednesday and Sunday in the lounge. Happy hour – 5:00 – 7:30 pm. Get discounted restaurant gift certificates! Get a $25 gift certificate for only $10 (normally $10) or even $50 gift certificates for $20! At times they offer codes with additional discount of 40% to 70% off! I’ll post the codes on my web-site when they become available. No expiration date on certificates! Euclid Fish used to be on East 185th. Now it’s in Mentor. Great place to get all kinds of seafood. Get coupons and something special sent to you for your birthday when you sign up to get e-mail promotions from Red Lobster at https://www.redlobster.com/secure/coupons/default.aspx?. It’s that time of the year for creepy McDonald’s fish commercials! This year doesn’t disappoint. McDonalds now has fish bites. I haven’t tried them, but pretty much anything fried tastes good. Check out this classic song clip about fish heads. Very weird video or maybe normal to somes of ya. About 2 and a half minutes into it is when it starts to rock. Get farmed perch filleted or whole all year round at Willoughby Aquatic Farm. Whole perch are $8 a pound. Valpak had a $2 off per pound coupon or $5 off $30 coupon. Mention their News-Herald ad and get $2 off perch. They are located at 38401 Apollo Parkway in Willoughby. Find pricing and info at http://www.willoughbyperch.com. Get a Bell + Howell Sonic Breathe ultrasonic personal humidifier by Emson for $25 ($60 value). For $7 get $15 worth of goodies at the Chagrin Falls Popcorn Shop. Get $20 worth Chicken and BBQ and other treats at Mr Wonderfuls for $10. Get Dancing Lessons with the Avon Ballroom for $35….regular cost…priceless. Get Bowling with Shoe Rentals for Two, Bowling and Snack Package for Four, or Bocce (Up to 79% Off) from $5. Pay $15 for $30 Worth of Local-Inspired Cuisine at the Corner Alley on East 4th. $148 for Online Personal Trainer Certification Course with Exam Included ($495 Value). At the Cosmetic Rejuvenation Center in Pepper Pike get One, Two, or Four Spider-Vein Removal Treatments (Up to 79% Off) starting at $89. Clever Clothes for Pop Culture Fiends, $15. On this segment of Good Morning Cleveland Jenn Strathman and I chat about all sorts of fish deals. Also, check back on Sunday when I post all kinds of fish deals on my blog (http://wwww.joethecouponguy.com/blog1). Click here for a $5 off $25 coupon good Sat., 2/23/13 only. Use the coupon at Giant Eagle. YMMV (your mileage may vary) as not all Giant Eagle’s have been consistent as to what they will take and what they don’t. If the coupon makes you purchase groceries at Dollar General instead of Giant Eagle then I think they should take it! A COUPON GUY EXCLUSIVE DEAL! NOW ON SALE FOR $14 PLUS $3 SHIPPING AND HANDLING! Get the Our Town book for only $17 TOTAL (reg. $28)! Save $11! A bargain for so many coupons! Buy 2 at this price! Get these deals and tons more. It’s like a flea market on your PC. Take an additional 50% off with code 50MORE on their Clearance Deals. Now thru February 24th get the Entertainment book for $19.99 PLUS Free shipping! Get $25 Restaurant.com gift certificates for $5! Regularly $10, it’s on sale for 50% off! Use code: DEALS. Deal goes through Friday, February 22, 2013! Take 20% off your next purchase on almost any deal* for $100 or less when you use promo code “MYFEB”. Add Deal by clicking “Buy Now” button on the Deal information page. Click on “Redeem promo code” during purchase process. Enter code “MYFEB” and hit apply. The amount of the savings will be reflected on the final purchase confirmation page. •*Not valid on the following orders: Android mobile app-enabled purchase and deals found on LivingSocial.com/escapes or LivingSocial.com/events. •Valid for first 10,000 purchasers only. •Promo code only good for Deals priced at $100 or less. •Promo code must be used between February 20 2013, 5:00 a.m. and February 22, 2013, 11:59 p.m. (Pacific Time). CHAGRIN FALLS POPCORN SHOP – Get $15 worth of goodies for $7. OLIVER TWIST – Pay $25 for $50 worth of food. MARIOS INTERNATIONAL SPA AND HOTEL – For $59 get $135 worth of spa manicure or spa getaway at Mario’s International Spa in Aurora. SOLON BICYCLE – Get a bike tuneup for $32 (reg $65) from Solon Bicycle. Take an Additional 20% Off Family Circle Magazine. Enter coupon WKLYSPEC During Checkout. Take an Additional 20% Off Martha Stewart Living Magazine – Enter coupon WKLYSPEC During Checkout – Just $15.96 for 1 Year! Take An Additional 15% Off at Best Deal Magazines. Enter Coupon Code PXCJ0224 During Checkout. Offer expires February 24, 2013. 250+ Magazines under $10 with this coupon! 60+ Popular magazines – Just $3.99 with this coupon! 30+ Popular Magazines – Just $5.24 with this coupon! Take an Extra $5 off $30 at Best Deal Magazines. Enter Coupon Code MNDCJ0224 During Checkout. Offer expires February 24, 2013. Take an Extra $7.50 off $40 at Best Deal Magazines. Enter Coupon Code MQQCJ0224 During Checkout. Offer expires February 24, 2013. Take an Extra $10 off $50 at Best Deal Magazines. Enter Coupon Code MQPCJ0224 During Checkout. Offer expires February 24, 2013. Take an Extra $15 off $70 at Best Deal Magazines. Enter Coupon Code MTKCJ0224 During Checkout. Offer expires February 24, 2013. The first 750 customers to buy $40 in Market Bonds earn an additional $10 in FREE certificates (limit one free $10 certificate per customer). Customers will receive a total of $50 in Market Bond certificates to spend at any West Side Market stand. Market Bonds come in $5 increments. Market Bonds are intended to boost vendors sales and help strengthen their business when the Market reopens. This promotion is made possible through the generous support of Charter One and the Centennial Fund in partnership with Ohio City Incorporated. This is a limited time offer. Support a Cleveland icon and the unique businesses that make up the market! The area has been experiencing a rebirth. Check it out if you haven’t been there in awhile. Park for free in their lot too! Do you want to surprised by a deal? Woot offers tech, clothes, contraption, wine and other deals. When they sell out they move onto another deal. $5.99 haircuts from 2/16/13 – 2/22/13 at participating Cleveland, Akron, Canton & Sandusky area Great Clips salons. Don’t let your kids walk around with taped up glasses or with one side missing. For as low as $6.95 you can get a pair of glasses! Need to sell your car or get a used one? Auto Trader is a good place to look. Reach over 15 million auto shoppers nationally and thousands in your area at AutoTrader.com. If you like it then put a ring on it. If you listened to Beyonce this past Valentine’s Day, then time for some wedding deals! Take 15% OFF orders $75+ at The Knot Wedding Shop with code MYDREAM15. Hurry, offer ends February 19! Bridesmaid gifts up to 70% off at The Knot Wedding Shop! Save on ALL totes, cosmetic bags, robes, compacts and more. President’s Day Sale: Save up to 50% on long weekend getaways! Ends 2/19. Book your flight + hotel for Spring Break and Save up to 45% + FREE personalized concierge service with Travelocity! Check out Travelocity’s Top 10 Deals! Now Save Up to $525 when booking a F+H Vacation Package with Travelocity. Top Secret Hotels: Up to 55% Off 3 & 4 Star Hotels! Book Flight Plus Hotel and Get Access to Travelocity Concierge Service for Free! Barcelo Hotels & Resorts – Luxury all-inclusives plus $200 resort credit with Travelocity! Ends 12/23. Hotel Two-Day Sale! Save big on limited time offers every Tuesday with Travelocity! Get 25% Off any Canvas. Use code JOY25. Hurry, offer ends 2.23.13. Offer valid online only. Receive 30% off any Photo Panel, Metal Panel or Easel Art, use code DECOR30 at checkout. Offer valid online only from 2.17 – 2.23. Get 20% Off any Photo Book. Use code PHOTOBOOK20. Hurry, offer ends 2.23.13. Offer valid online only. Giant Eagle now accepts competitors coupons. I was able to use the $5 off $50 coupon from GFS. Look for clothes and other items on clearance for $2 and up. Some items were around 80% off. Also check for clearance deals online at http://www.jcp.com/clearance. Use code UMBF049 to get 1 cent shipping through 2/18/13! Click for Clearance deals at Joann Fabrics! Get 30% off your online order at http://www.kohls.com with code CUPID30. Code good from Feb 13-20, 2013. Look for clothes up to 80% off online and in-store. Coats are now 70% off. Some shoes are 70% off. Save 70% on select Wix agricultural filters through 2/26/13. Get 5% off online when for Shop Your Way Rewards members wih code PRESIDENT2013 through 2/20/13. Staples® 8.5″ x 11″ Copy Paper, 5-ream case – You pay $24.99 – $20 back in Rewards = $4.99 after Staples Rewards – Save $20! – In store only. Limit 2 per customer. FREE earbuds with coupon and $25 minimum purchase coupon in ad. Staples® photo supreme 8.5″ x 11″ paper, double-sided matte, 50/pack – FREE after easy rebate, $14.99 – $14.99 easy rebate = FREE – Limit 2 rebates per household. In store only. While supplies last. Fellowes Saturn2 95 laminator – $29.99 after easy rebate, $159.99 – $60 instant savings – $70 easy rebate = $29.99 – Save $130! ESET Antivirus 5.0, 3 PCs – $9.99 after easy rebate, $39.99 – $10 instant savings – $20 easy rebate = $9.99 – Save $30! Canon® P23-DHV 2-line 12-digit desktop calculator – $24.99 – $9.99 instant savings – $10 mail-in rebate = $5 after mail-in rebate – Save $19! Staples® Turcotte™ chair – brown – $49.99 – 2 days only! Sunday and Monday. – Save $100! Sign up for their perks rewards at http://www.tuesdaymorning.com. Get priority notice of clearance and sale events, exclusive promotional events, VIP private shopping previews, special pricing on select products, 60-day return policy, and automatic entry into quarterly sweepstakes. 20% OFF All Contacts Lens Orders + FREE SHIPPING. Coupon Code: CONTACTLENS20. Get $20 off a purchse of $100 or more with code 12821 through 2/20/13 online at http://www.whbm.com. Up to 60% off with new markdowns. Get All You magazine filled with coupons and free nail polish for only $10! Find limited time magazine deals for $4.69 and more for annual subscriptions Plus get a Free gift with an order! Sat, Feb 16 & Sun, Feb 17, Food & Cooking Magazine Sale! Starting at $3.99! Save an additional 65% on Clearance items! Demarini Distance 30 or 31-inch Youth (-12) Baseball Bat Model DSL11 (2-pack) – $29.99 (was $99.98) – good bats! 50% off pedicure or massage at Deanne’s Hair and Spa$52 value for $26! Save Up To 50% Off Your Next Restaurant Bill – EXCLUSIVE 2-Day Trial To Saveology Dining Club – Limited Time Offer! Save up to 50% savings on movie ticket purchases, up to 50% off at top entertainment venues along with valuable offers at over 60,000 restaurants nationwide. Get $10 off a purchase of $50 or more. Use code BEEMINE-10 at checkout. Ends 2/21/13. Find deals for Grovewood, Sushi Rock, Mallorca and more. I went to the Rite Aid I usually go to and saw that someone ran into the pillar out in front of the store and the mailbox was also knocked over. I came to find out some lady drove into them, backed up and parked her car, went into the store, bought a newspaper and then left with nary a word to anyone. Recently, while we weren’t there to see it, we had someone run into the bumper of our car enough to slice it some and they took off. We all have accidents and that is why we have insurance. The best policy is to just fess up and take responsibility. I’ve had people dink my car and I’ve told them not to worry about it and vice versa too – the couple times I got rear-ended, nope, that’s another story. People appreciate honesty. Enough to forgive. As much as we want to think we are always right and do no wrong, we fall far from it. Best to lock in one’s mind to always admit to wrong rather than fight trying to be right all the time. Being humble goes a long way. I’m working with my cats to fess up which one left a vomit pile. So far neither one has raised their hand when I asked who did it, but they’re are still immature so I have to keep working with them on it. I know the guilt will eventually get to them too. Anyway, they got her license so I suspect she will be getting a knock on the door from the local police. How brazen that she still came in to get her paper. Did she think nobody would have noticed? She obliterated the pillar. I missed seeing it by less than an hour. The store looks like a wreck because back when hurricane Sandy hit the glass on the front doors were shattered. They still haven’t been replaced. When I went into the store I saw most of the regular shoppers there. One group talks so loud that I can hear them clear across the other side of the store. Nothing is sacred either. They will talk about everything from ailments to issues. I half want to whip out a lawn chair in Aisle 9 and grab some popcorn and pop and just listen to them. Hearing other people with issues makes ya feel better about yourself. You realize you don’t have it so bad after all. Makes for an interesting shopping trip. Keeps me from falling asleep while I am shopping too. 10) Start digging straight down to see if China really is on the other side. I tried and ended up in Guam. I think I went the wrong direction after I hit some magma. 9) Cobble together all the small pieces of soap in the neighborhood to make one the size of a Kleenex box. 8) Have a staring contest with people at the store. 6) Practice some break dancing moves that you’ve had on the backburner for awhile now. 5) Get to know your stuffed animals and their life plans. 4) Drink 5 gallons of sweet tea and lemonade whilst in your swimsuit. 3) Keep a diary. Read it to a class of kindergartners. 2) For a weekend live in one of the monsterous snow mounds in a shopping center parking lot. Invite your stuffed animals. Homes are picking up in price. Look for deals on foreclosure lists on the link below. Foreclosure.com – 7-Day FREE Trial! We just refinanced our home mortgage again. It’s the third time in about 6 years. The rates just kept dropping to the point we were able to shave more years off of our loan while paying about the same per month. With tax deductions for paying interest on the home mortgage it’s almost like getting a free loan with these low rates. Now is a good time to refinance or purchase a home due to the very low mortgage rates. The mortgage rates dropped to 3.31% for a 30-year loan in 2012, the lowest since Freddie Mac began keeping records in 1971. The 15-year mortgage rate dropped to under 2.63% in 2012, also a record low rate. Rates continue to be low, but can go upward quickly with the changing economy. As soon as the economy picks up the rates will go up too. Back in the early 1980s interest rates were in the 14% to 18% range for a 30-year, fixed-rate mortgage! Since 2000, mortgage rate have hovered around 4.75% to 6%. In 2000, the rates were around 7.75% for a 30-year mortgage and 7.72% for a 15-year mortgage. They are now more than half that rate! If you are purchasing a home, check for the best interest rates on http://www.bankrate.com. The PD Real Estate section on Saturdays and Sundays list rates too. Shop around because rates and closing costs can be different. Closing costs are negotiable. Some loans will give you a lower rate for no closing costs. You can also include the closing costs in your loan, so that there are no up-front costs. Find out how much your loan will be if you refinance at http://www.hsh.com/refinance-calculator. As an example as to how much you can save, if you borrowed $200,000 with a mortgage rate of 5.5% and refinanced to 3.3%, you would drop your payment from $1,136 to $832 for a savings of $304 per month. Another example shows how much can be saved by refinancing to a lower term. If you are five years into a 30-year mortgage loan at a fixed rate of 6% and refinance to a 15-year loan at 2.87%, you will increase your payment by $80 per month, yet cut the term of your loan by ten years and save $130,477 in interest! Making a $5,000 payment on the principal of your mortgage on a 30-year loan of $225,000 at 4.5% would save $13,000 in interest and reduce the term of the loan by 15 months. Before you do so, find out if there are any penalities for paying off a loan early. Most mortgage loans have a pre-payment penalty of 1% of the loan amount or a flat fee of around $350, whichever is less. The penalty usually won’t go into effect in the last year of the loan. The Home Affordable Refinance Program (HARP) eliminates the 125% ceiling on the loan-to-value ratio for fixed rate loans owned by Fannie Mae and Freddie Mac. If you have an underwater loan (you owe more than the house is worth), this program will help you refinance your mortgage to a lower rate. Find them at http://www.hud.gov/offices/hsg/sfh/hcc/fc or call 1-888-995-4673. Housing costs are starting to go back up so even if you didn’t qualify for a refinance in the past because you were underwater, you may qualify now. You’ll see furniture sales pick up for President’s Day. February is a good month for furniture deals. It is the time to also enjoy the horrible Value City Furniture commercials. They are so bad I can’t get enough of them. So campy. So visually appealing and mesmerizing like a bug zapper to night bugs. For $59 get $135 worth of spa manicure or spa getaway at Mario’s International Spa in Aurora. Get a bike tuneup for $32 (reg $65) from Solon Bicycle. Get $50 worth of fine Italian food for $25 at Osteria in downtown Cleveland. Get 2 hours of moving services for $90 ($285 value). $6 for a $12 admission to the Holden Arboretum in Kirtland. $8 for $16 worth of food a Joeys in Solon. $10 for $20 Worth of Pub Food at the Barley House in downtown Akron. $13 for Four-Pack of Animal Planet Dog Toys (67% Discount). From $119 for the Avenue Crowne Plaza Magnificent Mile-Downtown Chicago. Receive a red envelope with a chance to win a free meal up to $75. Envelopes available through 2/24/13. Tonino’s Bistro – Brecksville where 2182 was located. Babies R Us – Baindbridge location only – up to 70% off now. Spring break vacation deals, Presidents Day, Furniture deals, Babies R Us…put them altogether with Jenn Strathman and The Coupon Guy and there you have this morning’s segment on Good Morning Cleveland. OUR TOWN COUPON BOOK SALE! Get a free cup of coffee at Denny’s on Valentine’s Day, Feb 14th from 6 AM to PM. RESTAURANT.COM 60% OFF CODE- $25 GIFT CERTICATES FOR $4! Get $25 Restaurant.com gift certificates for $4! Regularly $10, it is on sale for 60% off! Use code: LOVE. Deal goes through Wednesday, February 13, 2013! Great to use over Valentine’s Day weekend! Get FREE gift cards and more from MyPoints. Join MyPoints now. Fill out our quick and easy form. Check your Email. MyPoints will send you a link to their shopping, coupon, and rewards centers. Earn free gift cards, dining, travel and more from over 50 top merchants, many you may already purchase items from like Macy’s. Most women love flowers. They also love them getting delivered to the office. Make them feel special like they deserve and get one of these deals doing so! Save $20 on Hearts in Harmony Valentine’s Day Bouquet – while supplies last! (2.8-2.13) This weeks hot deal – Mixed rose bouquet starting at $19.99 – while supplies last! Save 25% on Long Stem Red Roses! – while supplies last! (2.1-2.11) Sweetheart Deal of the Day – Shop now and check back daily for the latest hot Valentine’s Day offer! Ultimate Valentine’s Day Gifts from FTD – Flowers, Jewelry, Chocolates, Perfume, Teddy Bears & More – Multiple Gifts, One Service Fee! Add on a beautiful white Swarovski crystal heart pendant for only $29.99. Flowers + necklace = only one shipping fee! Aldi’s has the best deal for a dozen roses at $9.99. Most other stores are at $19.99 or more – Heinens, Kmart, Walgreens, Rite Aid… For a little more get them from FTD and have them delivered. Most women love wine. They also love getting wine delivered to the office. Make them feel special like they deserve and get one of these deals doing so! Join one of the best and most convenient ways to purchase the most exceptional wines from around the globe. Direct Wines travels the world searching for the best wines from top vineyards and family operated wineries. Don’t get two Buck Chuck when you can get the good stuff for just a little more with their monthly deals. Join Laithwaites Wine Club Now & Save $100 On a Case of Hand Selected Wines. Join Virgin Wines Club and Save $100 on 12 Hand Crafted Wines, only $69.99 plus free gift. Join WSJwine Club Now & Save $120 On a Case of Hand Selected Wines. Join Zagat Wine Club Now and Save $100 On a Case of Hand Selected Wines. Find rebates for wine on wine tags. They are hung on the tops of wine bottles and are found at most stores that sell wine. I’ve seen some for $36 off for a case of wine, sometimes more than that. Some are off of one or two bottles of wine too. You can also get 10% off on cases of wine at most stores. Markko’s and Harpersfield Winery from Ohio. Any Napa or Sonoma county wine is good – especially Darioush. Check Giant Eagle for discounts even up to 50% off. For sweet wine try any New York Reisling. Get a $15 saving pass for Fannie May berries with purchase. Find $25 restaurant gift certificates for only $10. Check back during the week for discount codes. Find your favorite restaurant on the site. Great to use over Valentine’s day weekend (check certificate to see if they take it on Valentines day itself). Free Communication Tuesdays – Communicate with your Matches for Free – 3 pm-11:59 pm PT. 12 stem rose bouquet – $9.99 – best deal in town! Purchase $50 bonds for the garden center and pay only $35 now thru February 28. In March pay only $40. In April pay only $45. Retail purchases only. Bonds are not valid on Gift Certificates, Services, Landscaping, Bulk (except Hardwood Mulch), or delivery fees. Cannot be combined with other offers or coupons. Bremec is not responsible for lost or stolen bonds. Bonds have no cash value and must be used in its entirety – no change will be given. All Bonds expire December 15, 2013. Bonds may be purchased at our Chesterland Office. January hours vary, please call 440-729-7438. February Office Hours 9am-4pm, M-F. Bonds may be purchased in person or over the phone. Coke products 2 liters – .66 after $5 Extrabucks Reward with purchase of 15.
Colgate MaxClean, MaxWhite or MaxFresh Toothpaste 6oz – Free after $2.50 instant coupon from in store coupon kiosk and .50 coupon. Orders over $49 SHIP FREE on CVS.com. Get 50 4×6 prints for just $5 at CVSphoto.com. Use code with code SMILE5 at checkout minimum 50 prints required. Offer ends 2.16.13. Get 40% Off All Enlargements or Collage’s at CVSphoto.com. Use code PRINT40 Hurry, offer ends 2.16.13. Tires at cost with the purchase of 4 tires PLUS get free tire rotation and balance for the life of the tires, 4 free oil changes, new valve stems, free flat repairs and free alignment check! Oil change, filter, tire rotation, and safety inspection – $9.99 with coupon in Val Pak mailer. Also go to http://www.emeraldautomotive.net for more deals. Giant Eagle ended its Foodperks program. Foodperks offered 1 percent discounts on food for every 10 gallons of gas at GetGo gas stationgs. Instead, they are now offering an additional 3 cents off per gallon on GetGo gas when you use your Giant Eagle loyalty card. Fuelperks already gives customers 10 cents off per gallon of gas at GetGo stores for every $50 worth of food purchased at Giant Eagle. Giant Eagle said that people were confused with the program and it didn’t save much for most people. I also see it as them trying to even out their new locked in lower price concept. With the elimination of free antibiotics and diabetes medication they are trying to pay for lowering their prices. Wal-Marts tactic to show they have everyday lower prices made them flinch. If I were Giant Eagle I would show how a sale price combined with a double coupon whips the pants off of Wal-Mart and put it in an ad in the newspaper. Wal-Mart doesn’t have sales and Giant Eagle has to exploit that in order to get people to realize there is a difference in the way both stores price their products. Get 20 cents in Fuelperks for every $50 spent on restaurant and fashion gift cards. Buy $50 or more in iTunes gift cards, get $10 off a future shopping order through 2/13/13. 2 select Free Cavs games tickets with $25 in Stouffers family size entrees. Pepperidge Farm turnovers and garlic bread – 5/$5 after 5 $1 coupons from Campbells/Pepperidge Farm coupon booklet found on displays at store. Look for coupons in Parade magazine. Tools up to 80% off. Use code 83634902 to get 20% off one item. Look for $10 off $10 purchase or more coupon in mail. $1 per gallon aquarium sale. and February Video Values coupon. Natures Bounty Potassium Gluconate, 595 mg, Caplets 100 caplets – $1.54 after $10 UP Reward with purchase of 4 and 4 $1.50 coupons and one February Video Values coupon. Take and extra 50% off Red Tag Clearance items in store and online through Sunday, Feb 10th! All Salon and Spa equipment are buy 1 get 1 FREE until through Monday 2/11! Enter promo code 555277. Free Vintage Glamour bag with purchase of any full size styling tool $39.99+ with code 444335! Valid through 2.28. This Week ONLY Clearance Special at Sears Outlet! Save 40% on Select Laundry Bundles! Must be sold as set, while supplies last! This Week ONLY Clearance Special at Sears Outlet! Save 35-40% on All refrigerators! Excludes new Frigidaire and Whirlpool New-in-box, while supplies last! 70% Off All Craftsman Brown Box tools at Sears Outlet while supplies last! Located next to Gales in Willoughby Hills. Dawn Dish Soap 9 oz – .49 after .50 coupon in ad. Heart & Joint Health Supplements – FREE after mail-in rebate – Includes products from top brands such as Renew Life, Arctic Naturals, Jamieson and BluScience. Get $5.00 when you spend $20.00 on any Charmin®, Mr. Clean® and Febreze® products. Get All You, a magazine filled with coupons and savings tips, for just $10 and receive FREE bottle of OPI Nail Polish in their exclusive color. Take an Additional 20% Off Martha Stewart Living Magazine. Enter coupon WKLYSPEC During Checkout – Just $15.96 for 1 Year!. Use bonus codes below to and save even more! Shape Magazine Just $3.99 for 1 Year at Best Deal Magazines, February 11th Only. Woodcraft Magazine Just $6.39 for 1 Year at Best Deal Magazines, February 12th Only. Digital Photo Magazine Just $5.29 for 1 Year at Best Deal Magazines, February 13th Only. Consumer Reports Magazine Just $22 for 1 Year at Best Deal Magazines, February 14th Only. Taste of Home Magazine Just $4.99 for 1 Year at Best Deal Magazines, February 16th Only. Natural Health Magazine Just $4.29 for 1 Year at Best Deal Magazines, February 17th Only. Take An Additional 15% Off at Best Deal Magazines. Enter Coupon Code PXCJ0217 During Checkout. Offer expires February 17, 2013. 250+ Magazines under $10 with this coupon! 60+ Popular Magazines – Just $3.99 with this coupon! 30+ Popular Magazines – Just $5.24 with this coupon! Take an Extra $5 off $30 at Best Deal Magazines. Enter Coupon Code MNDCJ0217 During Checkout. Offer expires February 17, 2013. Take an Extra $7.50 off $40 at Best Deal Magazines. Enter Coupon Code MQQCJ0217 During Checkout. Offer expires February 17, 2013. Take an Extra $10 off $50 at Best Deal Magazines. Enter Coupon Code MQPCJ0217 During Checkout. Offer expires February 17, 2013. Sat, Feb 9 & Sun, Feb 10, Valentine’s Day Gift Sale*! Give your loved ones a Subscription to their Favorite Magazines and include a Free e-Card! *Valid on select magazines. Take an additional 50% off clearance items with code 50MORE. 1Ink.com is having a Valentine’s week sale – Take up to 85% off ALL products! Customers can save big on name brand ink and printer supplies including Canon, Brother and HP. FREE Shipping on orders over $55 and a 100% satisfaction guarantee. Get these deals and more across the U.S. on Deal Chicken. 50% off jewelry at Wiant Jewelers. I’m not sure if they still do this in schools, but back when I was in elementary school we used to give Valentines Day cards to each other. You knew who liked you …or didn’t like you, according to the card you got. If it was lame, then you knew that person wasn’t all that keen about you. I think we started it in first and second grade. As I remember we constructed a pouch for all of our Valentines and we would tape it to the front of our desk. I think we would put our Valentine’s in them during lunch or when nobody was around so that you wouldn’t be putting a card in their pouch right in front of that person. That would’ve been too embarassing. To increase my allotment I would wear cologne and shine up my spats something fierce. I’d make sure I’d abdicate my place in line for the pencil sharpener for some little hotty to let them show my chivalrous side. At lunchtime I would give away my mashed potatoes (I didn’t like them anyway) to any gal that seemed like they were famished. With my one leg up on the seating area of the pull-down table I’d casually plop a tablespoon of mashed potatoes on their plate and let them know there was more of where that came from. Being generous makes a good impression after all. I’d go to the bathroom and comb my hair like the Fonz. The Fonz was the epitome of what ladies wanted so I mimicked his moves, including the “Heeey” thumbs up move that I’m sure drove the girls wild crazy. If I saw a gal smoking, I would be quick to offer them a pamphlet on how smoking is bad for their health. That way they knew I cared about them more than just a pretty little face. All that didn’t do me any good as in all reality I probably got a card just from the teacher and the janitor…I don’t know why. Each year I tried to pick up my game. I’d put on my best cordoroys and strut around like a show pony. I’d make a point to rub my inner part of my legs together to make that “frrrp” sound that cordoroys would make when rubbed together. I considered it a mating call of sorts or so I thought. I had to pace myself because in my haste to make lots of noise it started a small pants fire with all the friction. And they were my favorite brown cordoroys I ruined too. Just like a tip jar filled with dollars by a piano player to entice more people to add dollars I would add cards that I put together myself in my pouch. Seeing my pouch overflowing surely had to make the gals think that I was wanted and that would trigger them wanting to give me a Valentine’s Day card. I’d even put in a few dollars hanging out of my pouch just to make sure it drew attention too. The lunch-stealing bullys seemed to be fond of the easy money spilling out of my pouch. By 10th grade I stopped with the pouch on the front of my desk. Being that I moved room to room for classes and had to retape the pouch on my desk, the tape would lose its stickiness anyway. For the most part all I would find in it is those folded up triangle footballs made of paper. I tried though. You can’t fault a guy for trying…”Heeeey”. 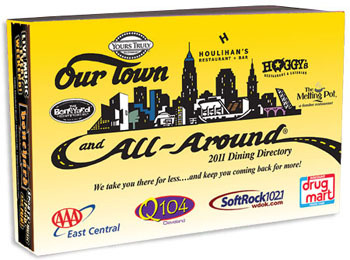 New low price on the Our Town coupon book – only $14 with $3 shipping (reg $28). See deal above. Around 1,000 coupons with tons of BOGO restaurant deals. Coupons good on Friday and Saturday of Valentines Day weekend as most coupons aren’t redeemable on holidays like Valentine’s Day itself. Check the Daily Deal sites like Dealchicken, Eversave, Groupon, and Living Social.com for spa, massage, flower, dinner, travel, and entertainment deals for you Valentine. Get low-cost tickets ahead of time using the Entertainment and Our Town coupon book. AAA also has good deals for tickets. Get extras for future movie dates. Canada will no longer produce pennies. The increasing cost of copper made the penny more expensive to produce than what it was worth. The U.S. has toyed with eliminating the penny too. They’ve also wanted to use a $1 coin instead of a paper dollar. Doesn’t make sense to me. Who wants to lug around $1 coins. Canada’s new guidelines urge store owners to start rounding prices to the nearest nickel for cash transactions. Electronic purchases will still be billed to the nearest cent. The government has said the cost of penny production is $11 million a year, and that the coins, which feature two maple leaves and Queen Elizabeth II in profile, would remain legal tender until they eventually disappeared from circulation. New Zealand, Australia, the Netherlands, Norway, Finland, Sweden and others have also dropped the penny. From now thru February 14, all 2013 Entertainment Books will be $14 off plus FREE SHIPPING! Sweet Valentine’s Gift: Half off David’s Cookies – $25 for $50 – Save 50%! $9 for a hanging jewelry organizer – Save 70%! 80% off a sparkling 12 carat tennis bracelet – Price: $24! A Two-Night Stay for Up to Four Guests, Sundays through Thursdays, in Select Cabins ($175) in Bryson Creek, NC. $40 ($109 value) for an hour of moving services at HaulMyMess. $25 for $50 worth of food at Sushi Rock. Pay $5 for $10 worth of food at Sonic. One or Three Pairs of 2-Carat Sterling-Silver CZ Stud Earrings (Up to 95% Off) from $5. After all, it’s the thought that counts. Customized name Sterling-Silver Heart Pendant with Optional Gold or Rose Gold Plating (Up to 74% Off). Free Shipping. Starts from $19. Brasa Grill, a Brazilian Steak-House Cuisine in Downtown Cleveland at West 9th, get award-winning steak house serves up all-you-can-eat dinners assembled from at least 14 slow-roasted meats in a wood-hued dining room for $30 – Save $30! Jets Pizza – located at 35535 Euclid Ave in Willoughby – look for free slice of pizza coupon mailed to homes. Lady Janes – new haircut location at 35535 Euclid Ave in Willoughby – $10 haircuts for the next 6 months. $2 more for shampoo. You are currently browsing the JoeTheCouponGuy.com Deals Blog blog archives for February, 2013.